A follow-up to Leaf's successful 2015 release, 2016 Leaf Greatest Hits Basketball features some of the biggest NBA stars from the past and present of the game. The high-end product promises one Greatest Hits autograph card and four buyback cards in every box. 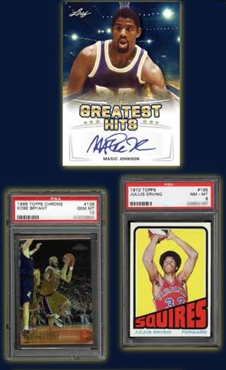 Among the buybacks that 2016 Leaf Greatest Hits Basketball has to offer, collectors will find graded cards that include premium memorabilia inserts, notable autographs and truly iconic rookie cards. Speaking to the quality and variety of the subjects, the sell sheet teased graded rookie cards for Kobe Bryant, LeBron James, Julius Erving, Wilt Chamberlain and Michael Jordan. 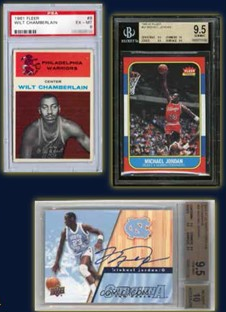 Basketball fans can find non-graded cards as well, including autographs from some of the most legendary players of all-time. 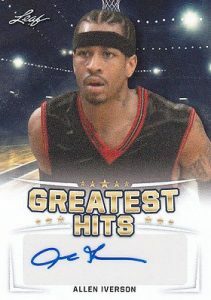 Hall of Famers such as Patrick Ewing, Bill Russell, Oscar Robertson, Magic Johnson and Allen Iverson are part of the signed Greatest Hits cards that fall in every box. These are the only original cards in the release as the rest are repurchased cards that come from earlier basketball sets across many brands. BILL RUSSELL 2016 LEAF GREATEST HITS AUTO AUTOGRAPH CARD! Shop for 2016 Leaf Greatest Hits Basketball boxes and cases.